In theory, toilets that flush automatically are the ideal bathroom update. They're more sanitary, have no handles to break, are more handicap friendly, don't waste water, and best of all, there's no need to worry about walking in on an unflushed mess. What appears to be the original patent for the sensor was filed in 1949 by Bokser Lewis under the name "Electric eye for automatically operating flushing valves." Multiple updates were made to the patent, including one filed in 1980 and assigned to the Sloan Valve Company (an article published on September 12, 1989 in The Financial Times titled "Technology (Worth Watching): the automatic flush" attributes the development of the high-tech toilet to the Sloan Valve Company). Regardless of the original intent to produce a life improver, people really don’t like them. So much so that there’s a thread of Reddit comments responding to a post titled “F**k automatic flushing toilets” (to be fair, some of those aren’t angry so much as helpful and supportive). Here are just a few of the many complaints directed towards those big whooshers. What does the need to implement automatic toilets, paper towel dispensers, and faucets really say about us? In Matt Johnson’s 2005 El Paso Times article “C’mon, you can’t be too feeble to flush toilet,” he argues that these technological updates are the result of people’s inability to be responsible, and that “they point out some of our society's worst traits: wastefulness and thoughtlessness.” So now, instead of turning off the faucets or remembering to flush, we can all rely on the magic of laser beams to do the work for us. Early infrared sensors, especially from the '70s, had trouble reading dark colors because, rather than reflecting light back to the sensor, they absorb it. This design flaw made automatic flush toilets unintentionally prejudiced towards anyone with a darker skin tone. For Nick Schulz’s loaded take-down titled, “The Crappiest Invention of All Time: Why the auto-flushing toilet must die,” published in 2006 on Slate, he interviewed Pete DeMarco, the director of compliance engineering at American Standard from January 2001 to November 2007. During the interview, DeMarco told a story to illustrate the early sensor failures. DeMarco remembers washing his hands in O'Hare Airport next to an African-American gentleman. DeMarco's faucet worked; the black man's didn't. The black guy then went to DeMarco's faucet, which he had just seen working seconds before; it didn't work. This time DeMarco spoke up, telling him to turn his hands palm side up. The faucet worked. It all led one redditor to comment, "those motion sensors can be pretty racist." Understandably, some toddlers are terrified of automatic flush toilets–the noise and unpredictability are enough to make anyone jump–and in 2007, the New York Times even ran the article, "For Children, a Scary World Out There (in There, Too)," about the problem. 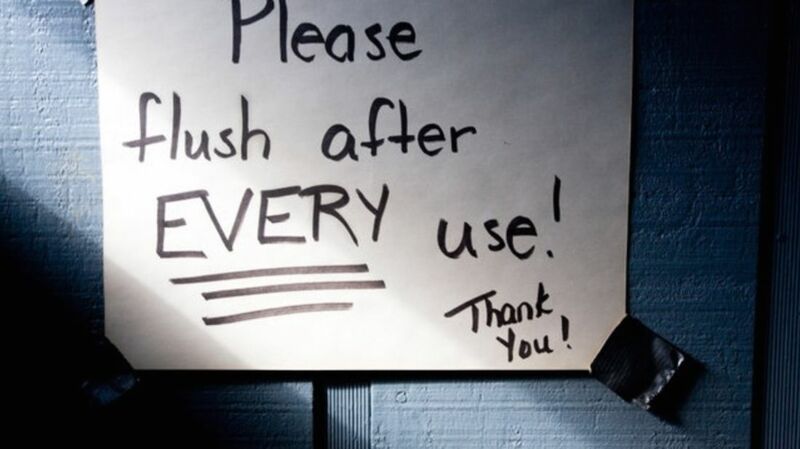 One mother, Jenny Tate, described her experience bringing her 4-year-old daughter Eve into three different rest stop bathrooms, hoping that one would be automatic-flush free. At the first stop, the automatic toilet set off hysteria. Two rest stops later, it became clear that all the toilets were the same, and the situation became urgent. “I ended up having to hold her down, crying and struggling with me the whole time,” said Ms. Tate, who added that Eve’s fears have since abated. Mommy blogs are still running rampant with new parents wondering what to do about their child’s inconvenient fear and whether it's normal. One popular solution is sticking a post-it note or a professionally made Flush Stopper over the sensor until the kiddo is ready to flush. Other parents force their kids to face their fears early on and remember that no matter what, they won't get sucked down the pipes. An argument on behalf of the automatic flush toilets is that they reduce unnecessary water consumption—there’s no option to flush multiple times (unless they also have the backup manual button). But super sensitive sensors misinterpret any movement as a cue and end up wasting water anyway. In Elizabeth Withey’s April 12, 2008 article, “The auto flush follies; Adventures with techno toilets,” from The Edmonton Journal, she describes an experience involving unintentional flushes. [It] has happened to me at the U of A, where I went into a stall in the engineering building to adjust a bra strap. Flush, flush, flush. I didn't even use the toilet. Is wasting water smart, sustainable, acceptable? No. So next time you get angry at having to do a jig in front of the blinking light to get it to flush, or at feeling a burst of unexpected toilet water hitting your bottom, know there’s an equally furious community of automatic flush haters who are right there with you.